I start before sunrise (6.00 am), it is still pretty cold. The mist and fogs of the early morning waft over the meadows but the sky is clear. The stage of the Vosges part will start today and I see the mountains in front. We will have to climb, this is sure. After the village Abreschviller the uphill begins and will end at the summit named Col du Donon (1009 m). Most of the road is in the woods and this is not so interesting. As we nearly have reached the summit the great surprise comes up. Aside the road there is an unspectacular little crater covered by grass and moss. 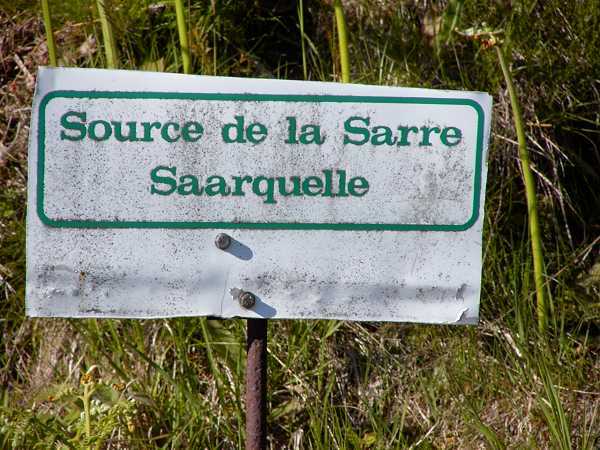 And a sign breaks the secret: this is the source of the Sarre. So I had made my way from the end until this first point of birth of this river. The downhill on the other side of the Col is fine for there is few traffic and the lanes are wide. My limit is 60 km/h. The race riders are faster, I know, but they have no luggage on their bikes. We come down to Schirmeck (380 m). Now there is only the main road and we have our trouble with the roaring vans. After some time I flee into the backyard of a church or a Kindergarten or both and now study the map thoroughly. And I really have overseen the small Col de Fouchy leading towards Ste Marie aux Mines, where the famous Route des Cretes starts. This route was built after the WWI (World War One) by the French military to defend the Vosges mountains agaist the barbarians from the east. It rises to 1000 m height and then stays at this height for about 60 km. At weekends with fine weather it is the eldorado of motor cyclists. The weather is fine as well but we have no weekend. But wait, we still sit behind the church. 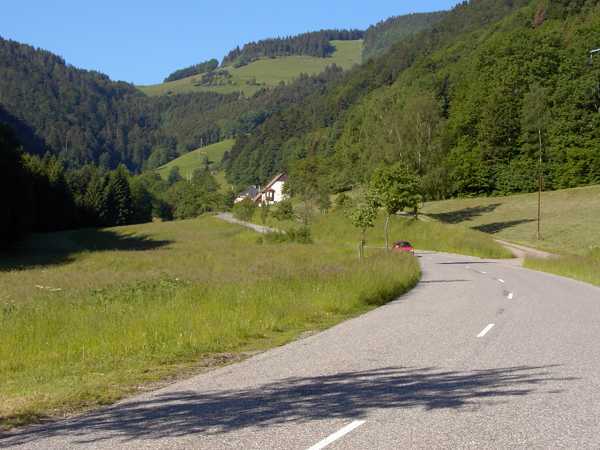 OK, there is a side road passing the Col du Steige, 534 m and Col de Fouchy, 603 m. On this route we can jubilate: the Vosges mountains represent themselves corresponding to our imagination. Wide views and nice villages, wells with flowers, houses with flowers. 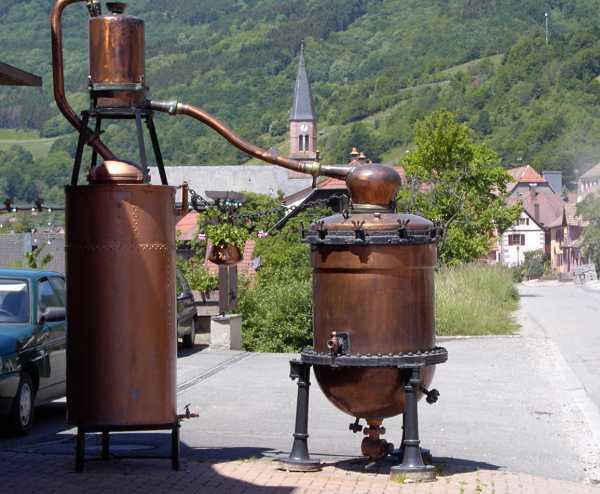 In this area they like to produce various kinds of schnaps and sometimes we see an old fashioned alembic aside the road - carrying flowers as well. At the Col de Fouchy we have to push the bike for a while and so sometimes stop and enjoy the views. Once a snake crosses the street in front of me. It is longer than one meter but it disappears in the grass before I can recognize her characteristics. Be lucky that just now there was no automobile or motor-bike coming along. So eventually we reach the summit and then descend into the Val d' Argent. At Ste Marie aux Mines I try to find a hotel. There is one but everything is deserted - may be it is too early in the afternoon. There is another hotel up the valley, a well known start point for the Route des Cretes. Let us sweat for another while - we have 27 deg. now. At last we come to the last bend and there it is: Les Bagenelles, "Tour-Riders are Welcome". I am only a pedal-biker but the money that I pay (45 €) is the same. Now this is a wonderful place surrounded by the mountains. The only noise are the sounds of the cow-bells and this is music that I will hear during the most parts of the further tour. After so much sweat today I make a laundry and hang the clothes on a sunny fence outside. There comes a snoopy donkey along and sniffs at my bike shirt (fire red and purchased on my Tour de France in 1995). So I take my clothes and bring them to another place. May be the donkey would like to wear such a proper bike-shirt himself? The donkey appearantly has a female companion because they often like to spoon with each other. Moreover there are geese and aside a lucky pig in it's muddy pigsty. At dinner I have porkmedaillons and housemade "Spätzle" (something like noodles). During the late evening finally there are more than 10 motor bikes in the stable and my poor little bike is nearly crushed. I have finished my breakfast when the sleepy motor cyclists blink into the sunny morning. 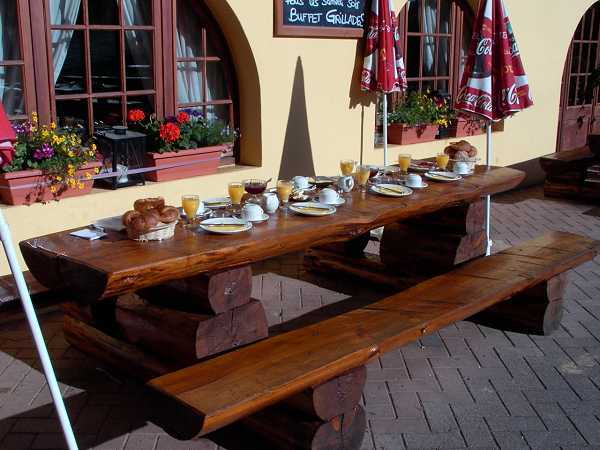 They will have their breakfast outside and let us hope that their butter will not melt. So we have "Kaiserwetter" and tailwind today - a highlight of the tour ahead! At first we have to climb 600 m to reach the legendary Route des Cretes. 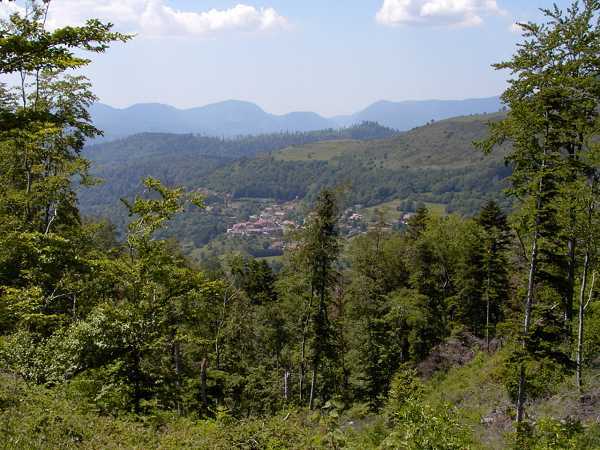 This takes about 2 hours until the Col des Bagenelles, 911 m. There we have a magnificent view above the blue ridges of the Vosges. We will ride the next 60 km at the height of about 1200 m. Of course much up and down but never for a longer distance. 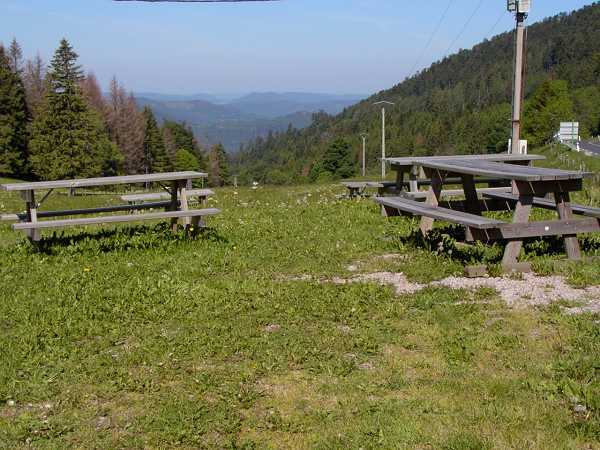 The key-points are named Col de la Schlucht, 1131m, or The Markstein, 1192 m. As well these places are the most nasty stations because there are wide parking places with busses and hordes of bus-tourists who hasten to the next toilets or restaurants or both. 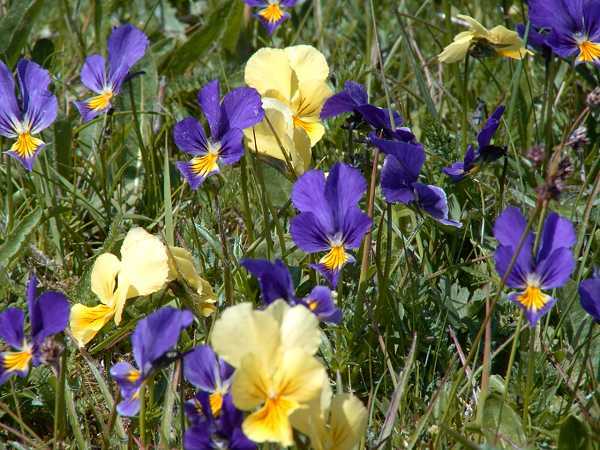 From a bicycle you will see, smell and hear more: the wild pansies at the side of the road, the tree tops with moss, the sound of the birds and cows and crickets. The direction of the views is mainly west and the cause for this is the strategic fact, that the route should be hidden from the east. 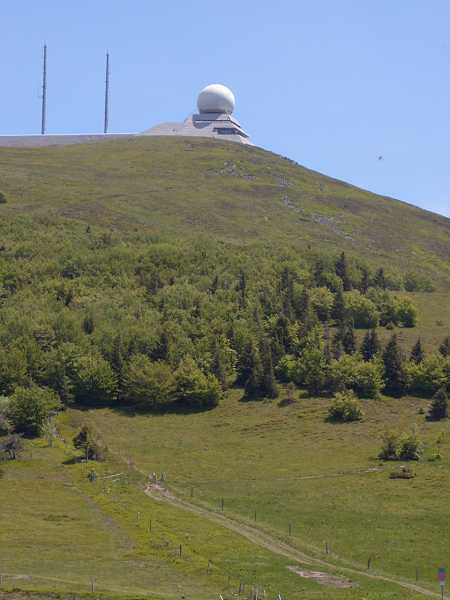 At last we have to climb up to the Grand Ballon, 1324 m, and this is the highest point of the day. Up there are parking places and much touristic activities as well. We run down unwillingly because the Vosges-tour soon will be over. Above Uffholz, where the road ends, we pass the Hartmannsvillerkopf and a memorial. 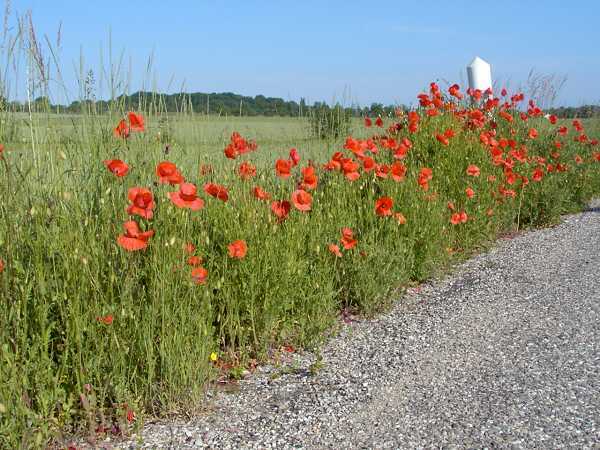 During four years of WW1 this hill of strategic importance was the place of bloody battles and about 60.000 soldiers of France and the same number of Germans were killed. 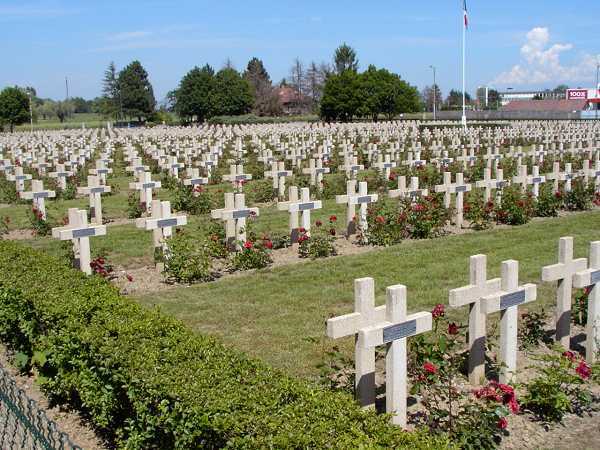 Unbelievable, but see the war cemetery at Cernay or other places with the innumerable rows of grave-crosses. At Cernay we have reached the plane of the Rhine and the temperature is like in an oven: we have about 34 deg. 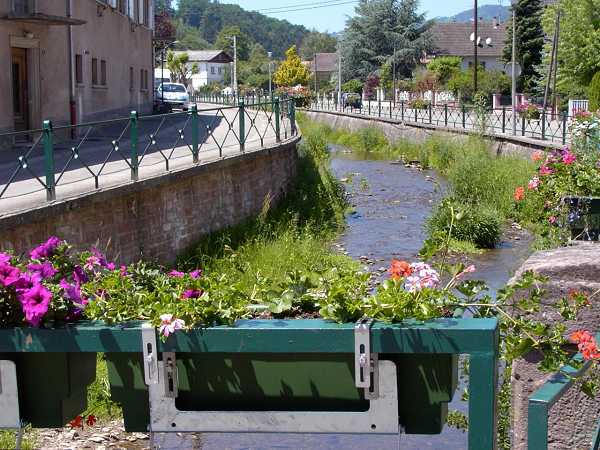 The other problem is to find out of Cernay. I pass a dusty gravel factory or so and then end at the driveway of a busy motorway. For I won't go to Paris nor to Marseille I must turn and ride back the dusty road. Eventually I find some side roads to approach the town of Basel. 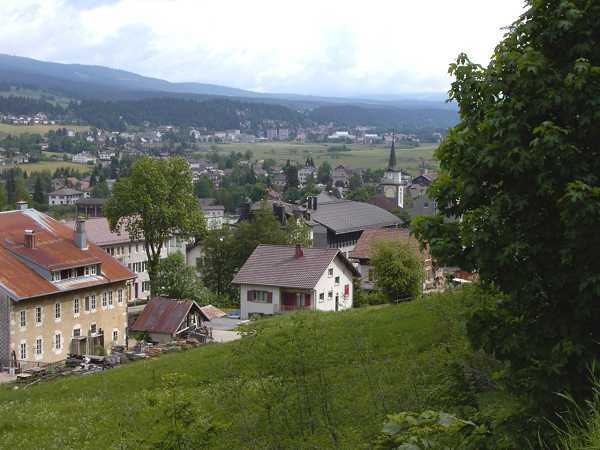 But today I only reach the town of Altkirch. Above the mountains of the Vosges meanwhile there are strange towers of clouds, it looks like columns of steam coming from a volcano or bush-fires. May be we have a thunderstorm tonight? 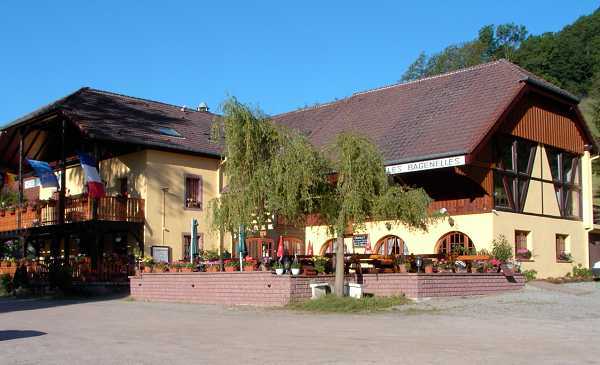 So I look for a hotel at Altkirch. The only one is closed. I ask a baker in front of his shop. "A hotel would be nice, but there are no employees" he says. So some km ahead there finally is a hotel at Wittersdorf. The chief leads me to a poor room, but as usual I am very happy to have any home. There is only a remote skylight window with a noisy aggregate behind it. But then I detect a swimming-pool down in the garden and soon I am in there and enjoy the refreshment after a hard day. The dinner comes out of the bags, the restaurant is too expensive. I am very happy as the aggregate falls in silence at about 10 pm. But at the next morning I will be annoyed that they charge 50.- € for this despicable hole of a room. And the breakfast is not so good as well... (The French serve a Petit dejeuner and it seems the Petit is the main thing of it...). I must go to Basel to get the first brochure of the "Veloland Schweiz". During the last few years they have managed to generate a grid of 9 long-way cycle-tours, to sign them, to document them by fine brochures and to sponser them. Of course those trails are more sportive than in Denmark or Holland, which are fine countries for cyclists as well. And Germany of course with fine river-routes. People have recognised, that the cycle-tourism may be an important fact in local economy. And if I look into my wallet one can see, that is not so cheap to go this way. May be it is a question of age: you like it more comfortable at some time. The cheaper solutions are a tent and camp-grounds, youth hostels, private pensions or cites and self made food. May be all the money you throw out will be kept off of an medical institute, which you are forced to consult caused by a lack of motion or another disease. At Basel begin resp. 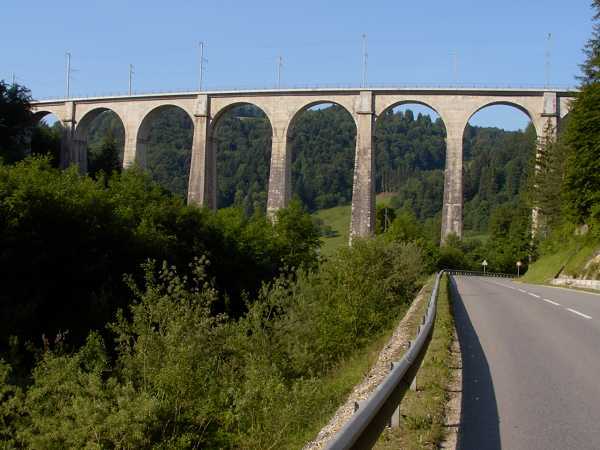 end three routes: Jura-Route(7), Rhine-Route(2) and North-South-Route(3). 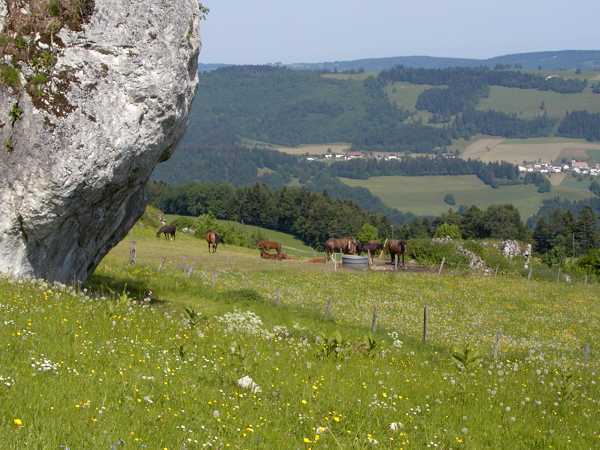 I want to ride the Jura-Route. So I only have to buy the guide for it. After 30 km this morning I arrive at Basel, just at the Spalentor, and the last time I was here is more than 40 years ago. Aside this towngate is a book shop. 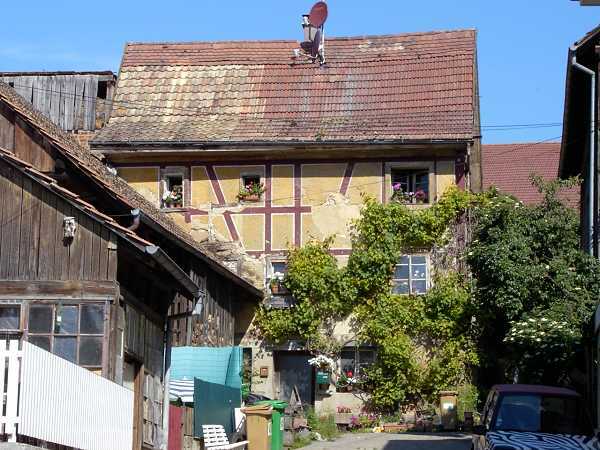 The owner has never heard of any "Veloland Schweiz". May be he has learnt something by my demand. I should go to the middle-bridge, there would be the information center. So I do, but cannot find the information. But a good bookstore to finally purchase the guide to veloroute 7. 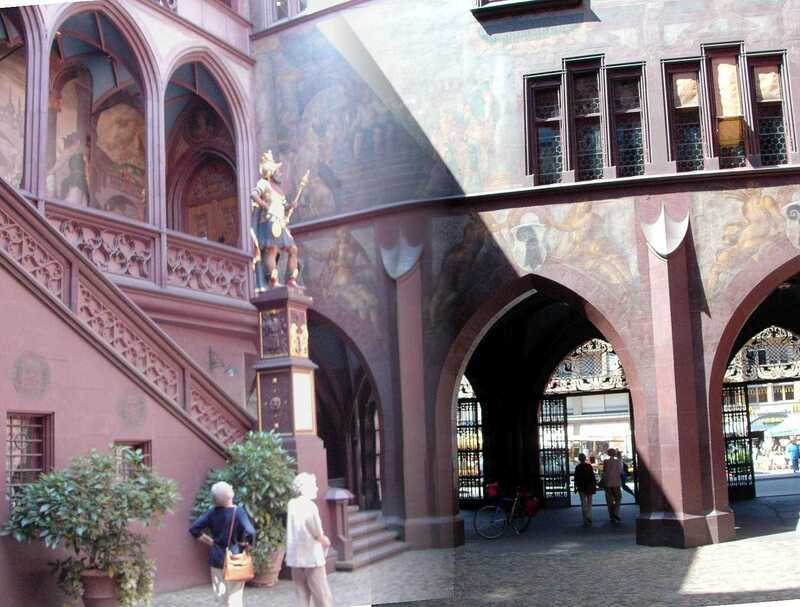 And that I do not behave like a philistine (Kulturbanause) I find may way to the market place and the townhall with it's inner yard and the wall paintings. But then we must continue. 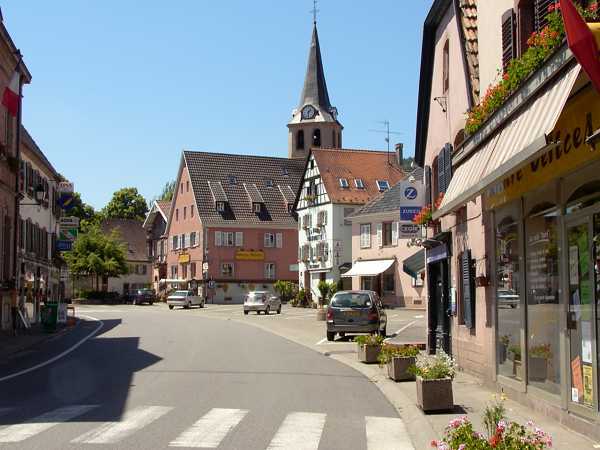 The veloroute is signed from the town center at the Rhinebridges. They have managed to find a way nearly traffic-free out of the town, sometimes along a rail-track. But then there seems to be the end of school somewhere and I find myself amidst of a cycling group of kids. It is just a steep uphill and I won't give up. May be I missed a fork by this challenge and finally are in unknown areas (Biel and Benken). Turning towards the mountains of the Jura I soon find the signs of the route again. So I have a rest on a meadow near Mariastein. This should be a place of pilgrimage but it is up on a hill. 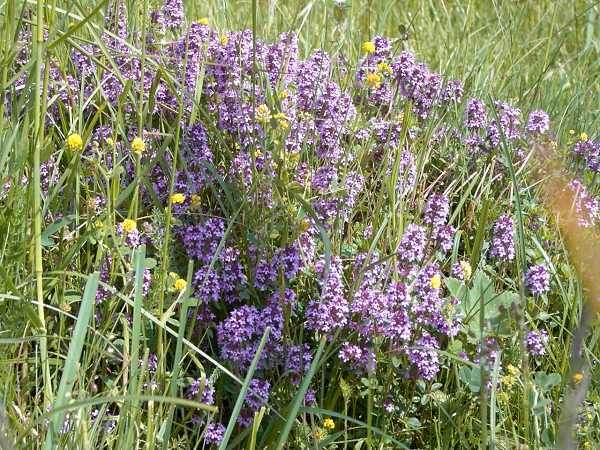 So I stay to my meadow, and thereafter have to climb anyway. 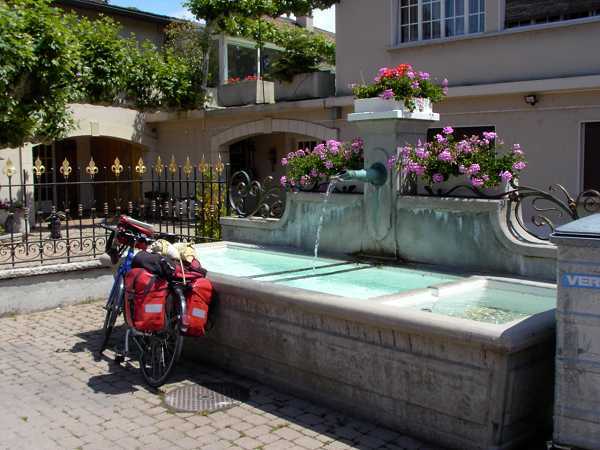 We reach the nice village Metzelern, where cheering kids have a bath in the fountain-basin of the village ("Eaux non potable" - no drinking water). I would like to do the same. To get something drinkable I enter a pub and go to the toilet. I get some water, but it is difficult, to mnipulate the 2.5 L bottle between the wash-basin and the water tap. Now a serious uphill follows up to 747 m, mostly in the wood and shadow. Up there we follow a nice path on a ridge and enjoy the first views on the blooming meadows of the Jura. 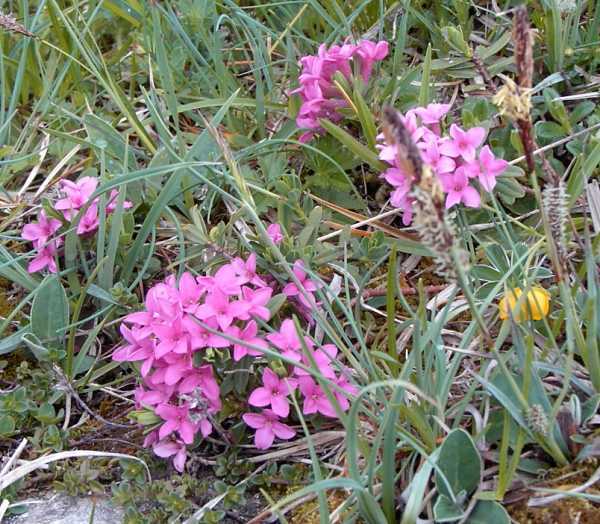 There are not the flowers alone but also a noisy concert by the crickets (Grillen). At a nice rest-place another cycling couple enjoys the landscape. Moreover there are joggers, walkers and hikers. Eventually I practise the Suisse greeting and this is "Gruetzi!". But a poor "Grützi" comes out of my rough throat and I prefer to say Salut or Servus. The other greeting phrases like "Pfüat di mitanand" or "Auf Wiederluage" are too difficult anyhow. At the end of the path on the ridge we fly down on the tarmac of a small trail among the meadows and cows. Suddenly there are two small, nearly invisible sticks across the path. The brakes yell and I bump against the sticks. But those are fixed by an elastic attachment and swing aside. 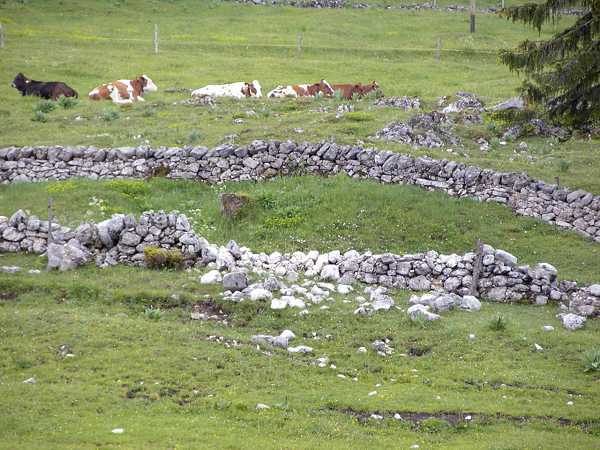 This arrangement seems to be for the cows which won't like to cross these barriers. Another barrier are the well known cattle grids, which are no problem for rims and spokes. 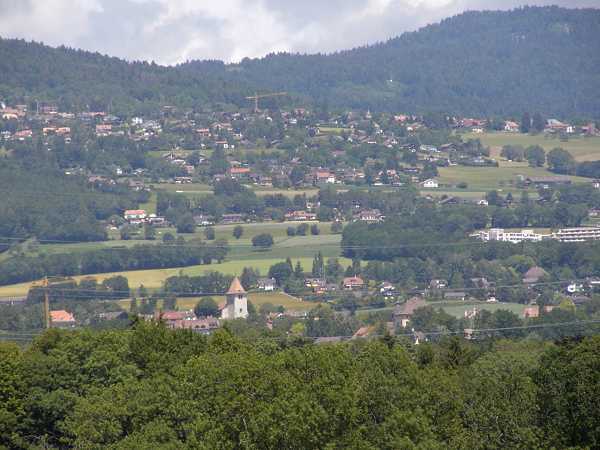 We then reach the valley of Leimen and Lützel. 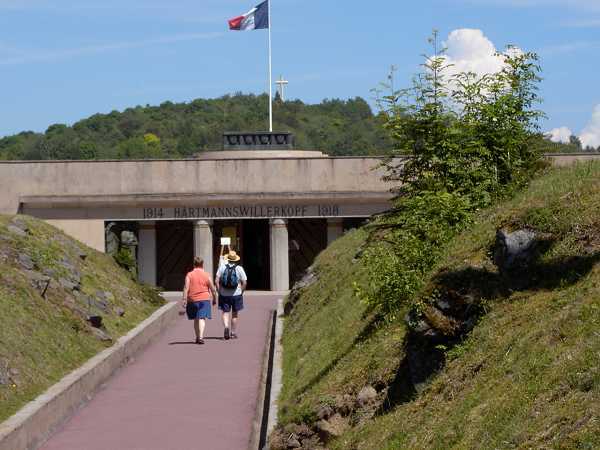 There is another historic trail swinging binational between Switzerland and France without any border controls. As I once have a rest aside the road the young couple from above comes up. 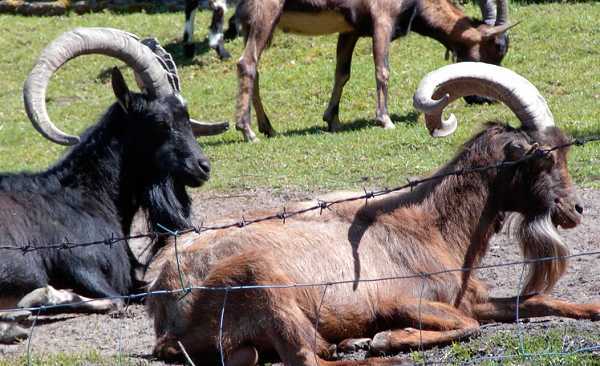 These are Stephanie and Raphael on a short holiday for the Jura-route. We discuss where we could stay overnight. 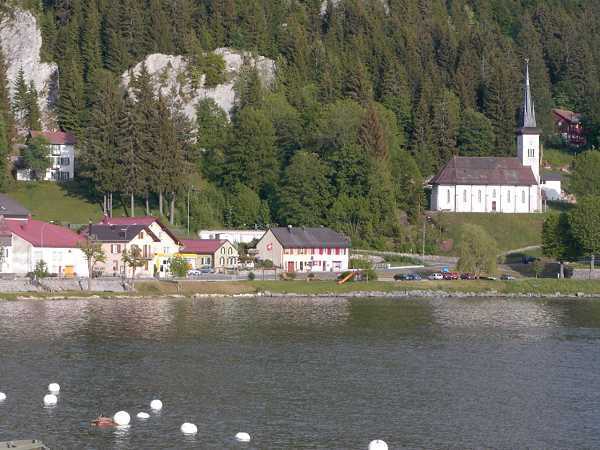 There is a very picturesque town named St. Ursannes 25 km ahead but a steep uphill of 789 m before. We are all tired a bit and do not know if we could do it today. Other places for an accommodation are rare in this area. In the next village Courgenay I find a supermarket and so can buy enough to be independent for the coming fate. Another cyclist comes along whom I had seen before. He is really on pilgramage to Santiago. He argues if he should continue from France per pedes. His daily budget are 25.- € , so he lives with a tent and a stove and other camping equipment. He looks to my speedometer and says "If you have 90 km already we will not meet again". He is right. I really start to overcome the uphill. It is crual. May be 20 % gradient. You must bend the upper part of the body down to the handle bar to push the bike. And you (may be not you - but I) have to stop after a while and breath out. After a long steep ramp I reach the last curve before the summit and fall into the grass. Now a vivid mountain biker comes from below, twisting the pedals in a much lower transmission than available at my bike. I clap my hands to give applause. So I have recovered and then fly down to the valley of the river Doubs. The brakes and crickets yell in turn. Everything flies along as you must concentrate to the downhill path. In no time (from the summit) we now reach St. Ursannes, the favourite destination for today. On the central place I meet Stephanie and Raphael who just admire the medieval surrounding. They have arrived minutes before - so I am proud not to be so slow. My other eye has detected some hotels meanwhile. S. and R. will go to the campsite and purchase a travel trailer for the night. I go to the Demi Lune (55.- CHFR). The river Doubs is a very mysterious one. There are deep gorges and canyons and so it is mostly unreachable. At some places the waters run underneath and come out at another place again. The rush of the waters accompanies my dreams. In the sunny morning we shoot some fotos of this romantic town. Today we have another uphill up to 1000m, that is 500 m higher. We pass the viaduct of the railway, see it from below, but some time later we see it from above. I then meet a woman with a shepherd dog. "A pretty stretch ahead" she says. "But the views get better all the time" I say and this is true. Finally the route leads up above at 1000 m height all the time and is nearly traffic free. Meadows, flowers, lonely estates, cricket noise, red kites, grouped trees - all like a park landscape. As I just pack in my camera S. and R. come along. 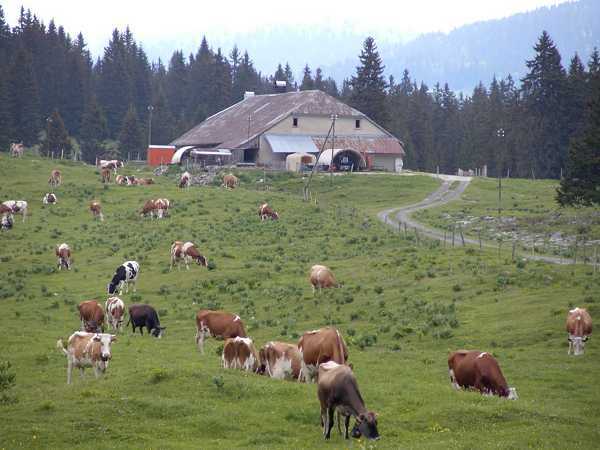 They want to visit a cheese factory at the village with the pretty name Saignelègier. But they will not succeed because we have a celebration day today, Feast of Corpus Christi or so. For the last time we meet at a lake named Etang de la Gruère. From there they roll on and I did not see them again. But I gave them my card, may be they send a mail at some time. So let us visit the lake, shoot a panorama an then flee away from a noisy group of kids and lads. 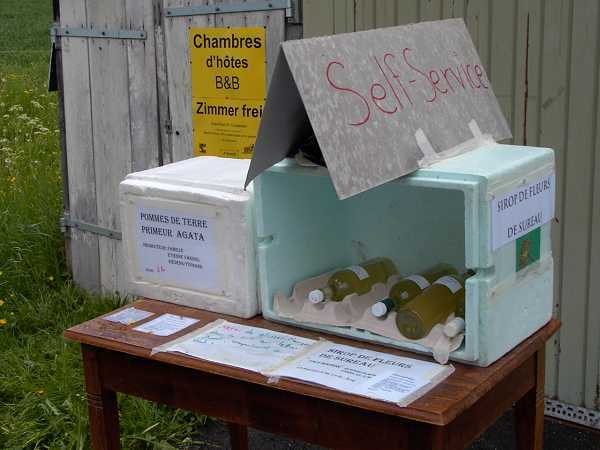 The next higher point of the route is then Mont Soleil, 1200 m. At a rural restaurant I want to refill my bottle again and have the same problems as before. So I rush behind the counter and quickly fill the bottle with water (not beer) while the woman of the restaurant is busy with her mobile. As the full bearded chief comes up I and my full bottle just disappear around the corner. 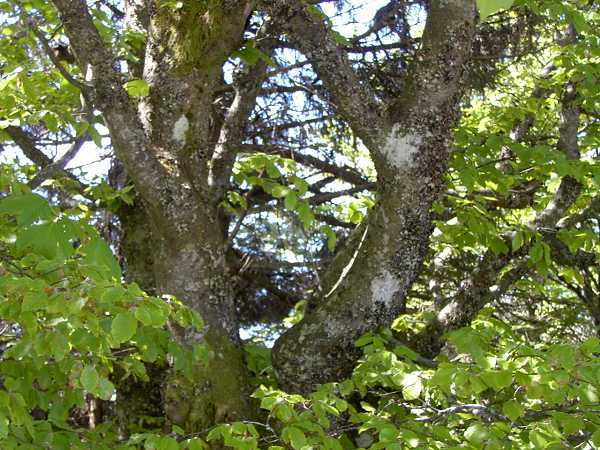 At the slopes of the Mont Soleil corresponding to the name they have arranged a solar-parc. One can visit this place but in the moment we just have no sun. Some time later I even have to hide under a barn's roof to keep dry from a sudden but short rainfall. We then run down to the town La Chaux de Fonds. "a revolutionary style of town planning in 1000 m height" is to be read. May be something like the German "Bauhaus"? Even the famous architect Le Corbusier was acting hereabout but left the town with anger. Today they are proud of the famous name. I only touch the town and head for the last 20 km until the village Les Ponts de Martel. 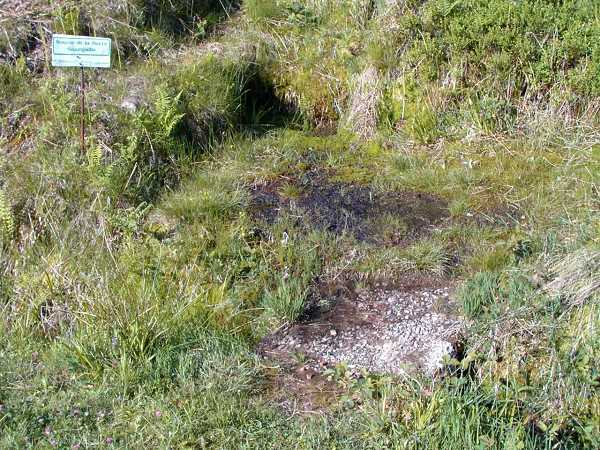 In this valley (Vallée des Ponts) there are high moor areas and near the village there is a karstphenomenon where the waters from above disappear in the ground. But at first I look for a hotel but there is no one, the people sit in the restaurants and drink. Some km ahead I finally arrive at the Restaurant de Poneys. Though I made not so many km for today it was another hard day. I get a complete storage under the roof here and I am the only guest. 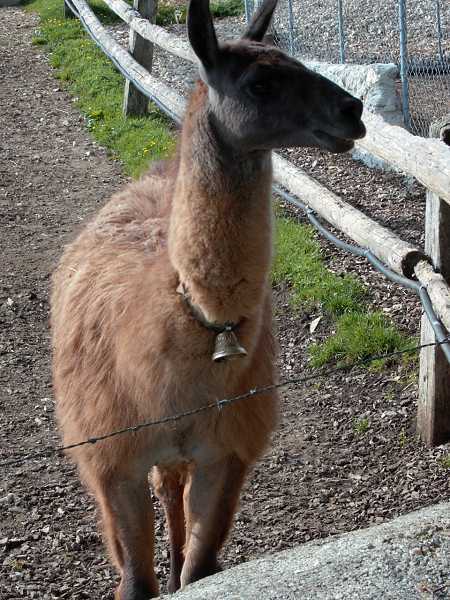 The view outside shows a meadow with cows and a curious Llama. Let us hope it will not spit. At dinner I get Schinken-Rösti, this is bacon and rasped potatoes or so. I pay the bill and declare that I will start before breakfast tomorrow. "You don't want to eat?" they ask. I insist to say "No" and so they may argue what a freaky madman was coming in and at once is going out again? So do I! At 6:30 am the freaky madman tiptoes down the backstage and starts into a misty morning, awaiting another day with "Kaiserwetter" and tail winds. He is wrong today and better should have enjoyed a solid breakfast. Now it is grey and cold and after some up and down we reach the valley of the Traveuse and have breakfast on a bench (bread and cheese). A man comes up with his dog but both immediately retreat vis a vis this freaky guy on the bench. We ride down the Val de Travers with some industry. We pass towns as Couvet or Fleurier. Another 400 m heigh climb is waiting and when this is accomplished the rain starts. The next pass ist the Col de L' Aguillon, 1320 m. A rest before under the roof of a deserted factory building. I see another cyclist coming along under his raincoat. I meet him some time later when he packs in the raincoat. This is Markus, a Suisse guy who rides around following the side roads of the Michelin road maps. "Let's go together for a while" he says. "OK, but I am not so fast" I say. "I will conform to it" he says. So we ride together and the uphill is moderate. I get to know some stories. His accommodations are huts or meadows or under trees. Only yesterday the youth hostel at St. Croix, 30 CHF, this is expensive. His brother once was a member of the famous Suisse velo-regiment. Now he has a bad knee and cannot cycle since then. 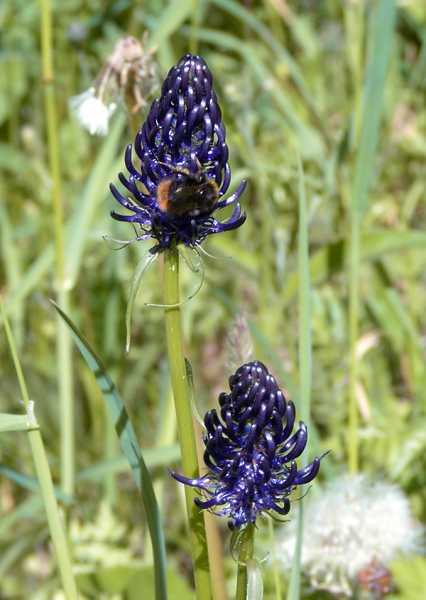 I show him the flowers aside named "Trollblumen". He has never heard of them. 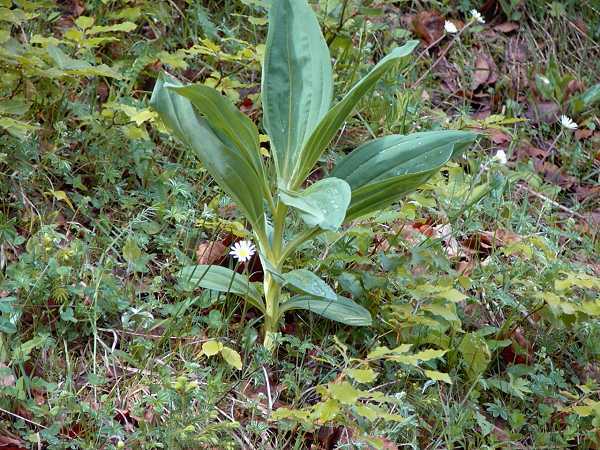 I ask for another plant which is to be seen everywhere, for the cows apparently do not like them. He says: "May be this is the shitflower because the seed comes out of the cows and their stomache". 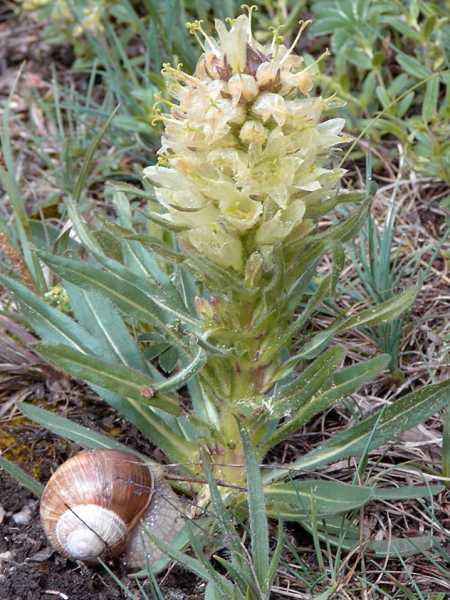 I believe that this is not the solution to the secret of this plant (I believe it is the highly toxic Weißer Germer, Veratrum Album, and in earlier times this was used as a poison for murders - so to read in the internet). Meanwhile I am out of breath and say that I need a rest and will continue somewhat slower. So we part, he gets the card and may be he reads about himself at this place one day. The rest of the pass is easy to climb and on the summit you may breathe out: there they are, the Alps. A blue jagged silhouette! It is too hazy for a photo, but be patient, you will get your photos! We fly down in zigzag and full braking. But the rims are not so hot that they would burn off the tyres. At Baulmes they have school-end and I must walk through the masses of wild pupils. The further route is not so clear, so I pass a lonesome horse three times (1. forward - am I wrong? - 2. back - no I was right - 3. forward). But the path is bumpy and not so good. Back on the road the rain and wind resp. storm comes from ahead. 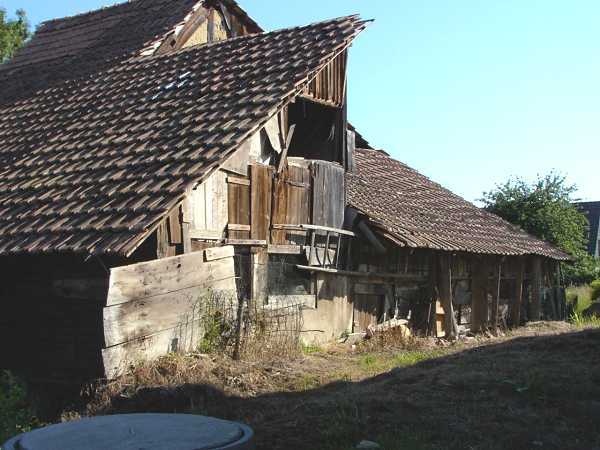 At first I cower behind a barn, then in the hut of a former wash basin with a fountain. It rains heavily. After half an hour or so the rain runs out and I can go on, the wind is not so strong finally. We come to the town Vallorbe and then have to overcome the last pass M. d. Oxeires, 1000 m, for today. Unfortunately there is only the main road available because the smaller path on the other side of the valley is steep and rocky (so it is said in the guide). Up above on the summit there is the Jura-Parc. Some birds crie like pelicans but this would not be their natural site. You can observe bear, wolf, bison and other animals. So do some families with buggies and children who strive towards the entrance. Some days later this place will be the arrival of a Tour de Suisse stage. This year this tour was won by Jan Ulrich, but may be only because I was always in front of him. 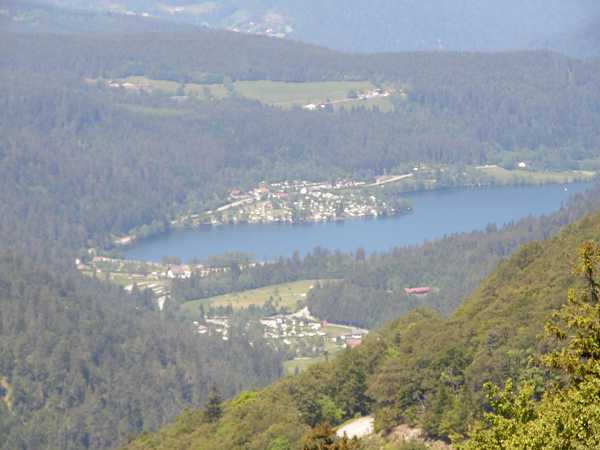 The downhill is short to the village Le Pont, located between a smaller and another longish lake, the Lac de Joux. Though I started early I have not made much distance today. But the weather is too bad so I finish at Hotel de la Truite. Some time later it rains again so I was right. There was a steady rush by the rain during the night but the morning looks better. Today it will be the last stage in the Suisse Jura. 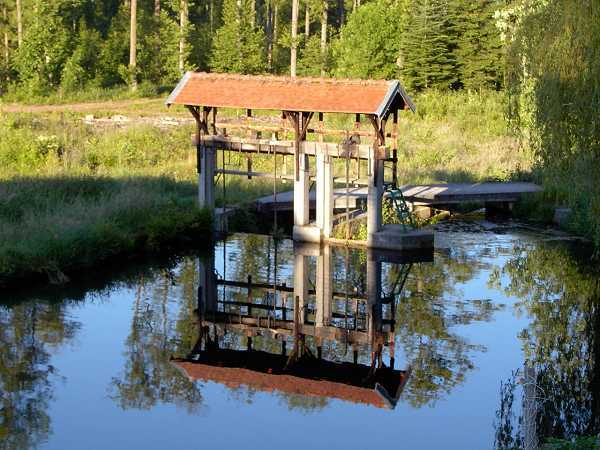 Along the shores of the Lac de Joux, where the anglers set up their environment with rubber pants and so on. From Le Brassus, 1021 m, the last climb leads to the Col de Marchairuz, 1339 m, and this is the highest point of the Jura-tour. 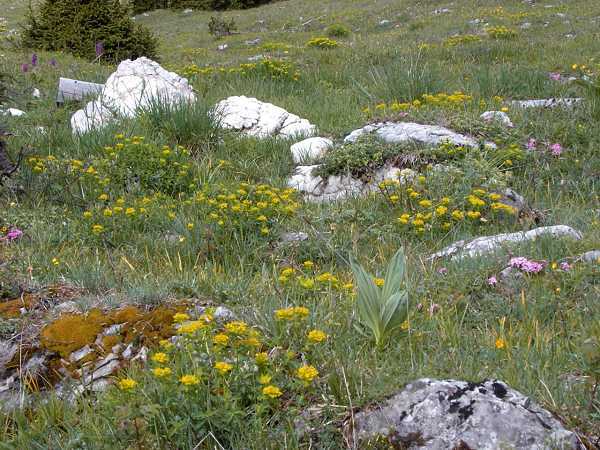 But the climb is very amusing: the wide views to the Val de Joux (joux=wood), pasture land and meadows crossed by stonewall hundreds of years old, flowers aside the road. 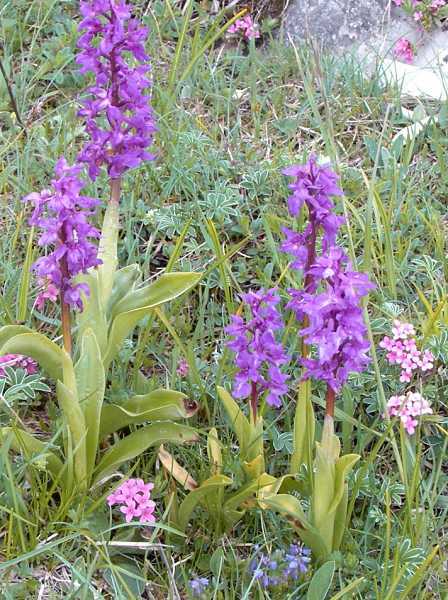 Once I sit in a natural stonegarden to take a photo of some orchids and primroses. I would like to sit still there. So we are soon at the highest point where we have to go right and know: no more uphill at all. This is beautiful high valley with a narrow road. Suddenly some oldtimer cabriolets come along. They are as happy as I and we wave to each other laughing. Now let us concentrate to the last and long downhill. There are dangerous gutters across the street so a higher speed is not possible. It is always a sad thing to change the energy, that was saved by sweat into the heat of the rims. Let us stop at Bassins and throw a view to the Lac Leman and the panorama of the Alps. 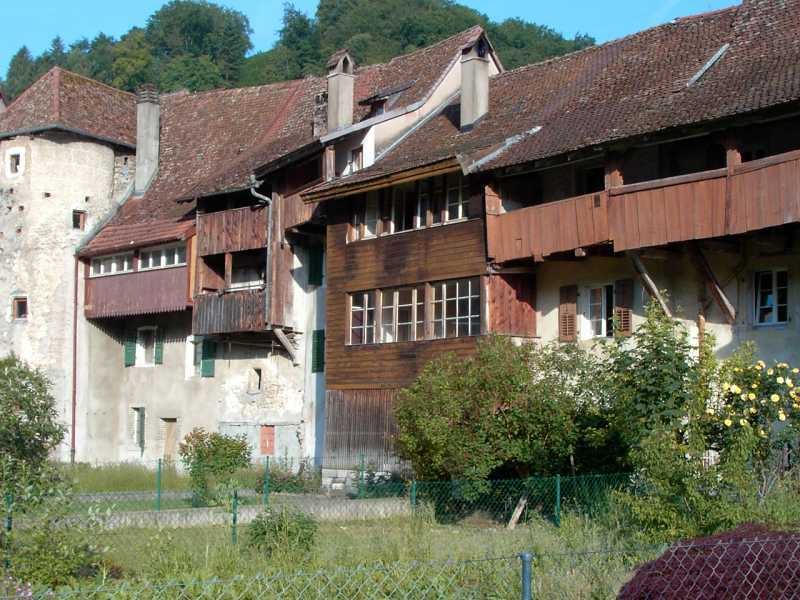 The town of Nyon is the final point. We have noon and I will continue. I want to buy the brochure Rhone-Route, Tour 1, which leads up to the Wallis and the sources of the Rhone. The tourist bureau is closed. The bookshoppers as well as the kiosk sellers are completely innocent concerning Veloland Suisse. I only can purchase a road map of the south-west Suisse so that I am able to recognise the current location. This was 10 km detour because I could have turned to the route 1 earlier. From Nyon towards Lausanne I first use the main road. This is no fun. At the fork to Gland I turn left and soon hit the signs of the Rhone-Route. Now we ride traffic free among wooden houses and flowered village fountains. 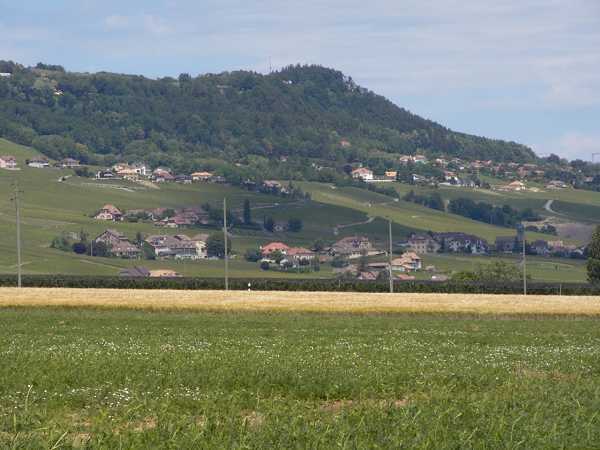 This is another thing, we pass the nice vineyards at the southern slopes of the Jura above the Lac Leman with a wonderful sunshine. Once I have a rest at the lake. There are two great crested grebes (Haubentaucher) mating. Suddenly they forget their love and hurry crying towards a certain point of the water surface. At this point a bended backside of an animal is to be seen, then it disappears, then it comes up again. No fish, larger than a rat. So I can only argue: a beaver or an otter or a Suisse Nessie. Let us believe in the last assumption. 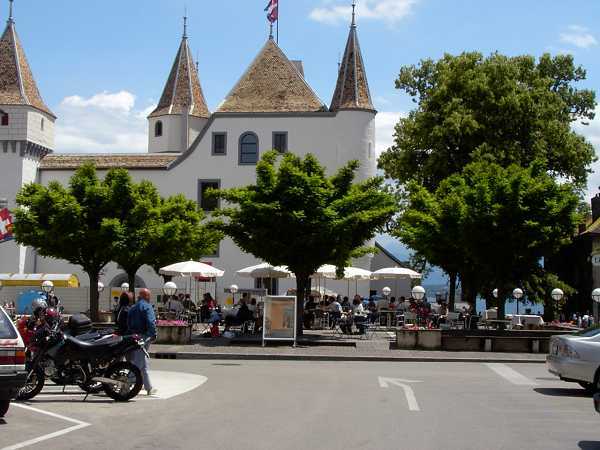 A larger town Morges follows and a bookshop has the Rhone-brochure, but in French only. I visit the supermarket to be autarcic for the evening. This area is not the cheapest - as everyone knows. We come to Lausanne and prefer to stay to the shore of the lake. Eventually we find a park with remains of the Roman origin Lousonna. The modern Lausanne is roaring to the left and I succeed to avoid it nearly completely. Back in the vineyards we once find a twisted concrete path half up the slopes and this is beautiful (near Lutry?). 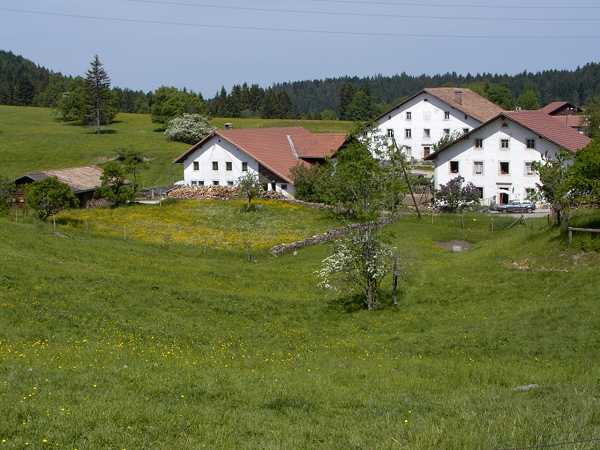 Behind the village Cully there is a Comfort Hotel with the flag of the Suiss Velo-Organisation. So we stay here for the night. I choose a room on the backside where unfortunately the Lac Leman is not to be seen but fortunately the roaring traffic of the road is not to be heard. I spend the evening with laundry and dinner from the bags.